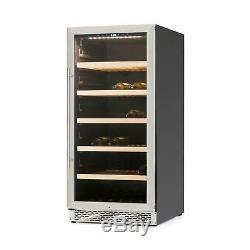 Klarstein Botella 120S Wine Cooler 270 Liter Stainless Steel LED. 270-liter capacity for 122 bottles. Five removable wooden shelves and interior LED lighting. LCD display with temperature display and touch-sensitive control panel. Steel-glass door along with a stainless steel handle. Environmentally friendly wine cellar with a 270-liter capacity for 122 bottles. Five removable wooden shelves and switchable interior LED lighting. Quiet when in operation, easy to clean, and economic in its power consumption with a energy efficiency class of A. Black metal housing with a lockable steel-glass door along with a stainless steel handle. Temperature: 5 - 20 °C. Type of installation: free standing. Door hinge mounted on both sides. Power supply: AC 220-240V, 50/60 Hz. 59.5 x 128 x 76 cm (WxHxD). 49 x 105.5 x 54 cm. User manual in German (other languages: English). 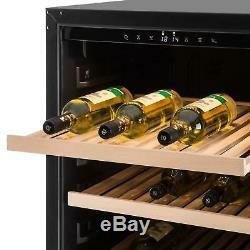 Wine cooler with five wooden drawers and a 270-liter capacity for up to 122 wine bottles. Touch-sensitive control panel and switchable interior LED lighting. Stainless steel door with stainless steel handle and large panoramic windows. The Klarstein Botello 120S wine cooler is a refined winery, which has opted again of just being a space for storage but instead offers itself as a magnificent stage for up to 122 bottles of wine. 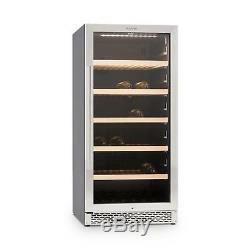 With a large double, glass panorama door, the wine cooler advertises its 270-liter interior. In conjunction with its dignified appearance, the device remains fitting for exposed installation in gastronomic establishments, wine shops and at bacchanalian events of all kinds. With a selectable temperature range of 5 to 20 °C, the needs of different wine types, needs are adequately taken care of and beyond that offers the option to fill the wine cooler with other beverages. The operation is controlled via a touch-sensitive control panel with temperature display in Fahrenheit or Celsius. 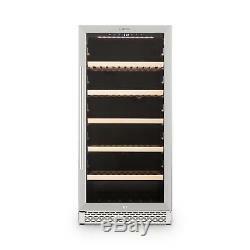 Thanks to the switchable, white interior LED lighting, the stored wines are elegantly presented. 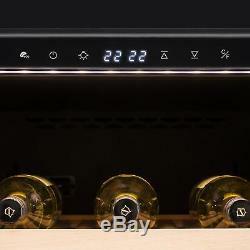 The device is delivered with five elegant, removable shelves and also a fixed storage space, which allows for a flexible segmentation of wine batches and quick access to the various wines. Wine storage is not a case of one size fits all. Many factors affect the taste of a wine - two key factors affect it. The cooling and storage temperature of red wine is usually in a range of 12 - 18° Celsius, whereas white wine and sparkling wine are served cooler. 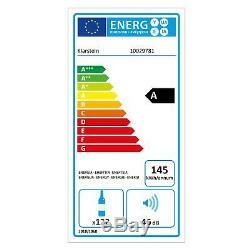 Information Required by the Energy Consumption Labelling Ordinance in Conjuction with the Delegated Regulation (EU) Nr. Supplier's name: Klarstein Supplier's model identifier : 100297821 Category of household cooling device models : 2 (refrigerator with cellar zone, cellar-rich cooling unit and wine cabinet) Energy efficiency class : A Yearly energy consumption (AEC) in kWh/year : energy consumption 145 kWh/year on the basis of norm testing over a period of 24 hours. 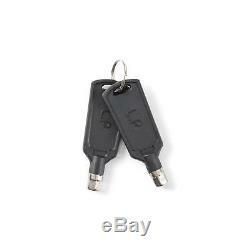 The actual consumption depends on the usage and location of the device. Rated capacity (number of standard 0.75 liter bottles that can be stored in the device) : 122 bottles (270 liters net capacity) Lowest storage temperature of the wine in Celsius : 5° C Frost-free : not applicable; device without frost-free system Temperature rise time/ Storage time in hours during disturbances : not applicable Freezing capacity in kg/24h : not applicable Climate class : SN, N, ST, T This device is for the operation in an ambient temperature between 10 °C and 43 °C. Airborne sound emissions in dB(A) re1 pW : 46 dB(A) re1 pW Built-in device : no. This device is intended exclusively for storing wine. The item "Wine Cooler Fridge Refrigerator Bar Restaurant 122 Bottles Glass Stainless Steel" is in sale since Wednesday, March 27, 2019.